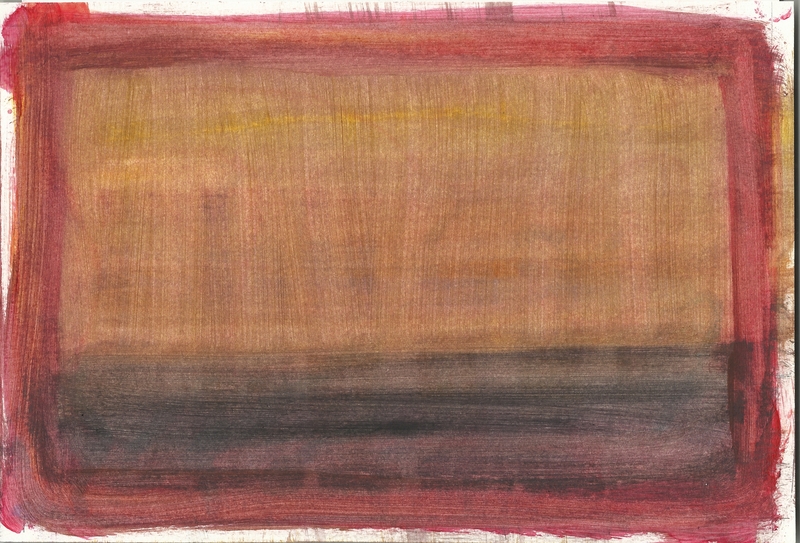 A new painting that is a bit of an homage to Rothko. This is not the painting I expected to emerge but here’s the end result. Probably 4-5 layers of paint. Love the subtle filtering of colors and strokes that emerge the longer you look. I only used watercolor paint I had on hand and applied the paint using a few pieces of sponge I cut off my kitchen sponge. Very Rothko-like. I like the organic look here. I used to live in Houston and got to see the Rothko Chapel. Very cool. Hi Kari, thanks for your comment. I was watching something about Rothko recently that was telling about the chapel he was commissioned to make those large murals for. Very cool indeed. The intensity of the dark colors he used for the chapel murals is breathtaking. It is a very peaceful place when you’re not there for a lecture or symposium. I did get to go with a friend when it was almost empty and you can sit for hours! You are right about the dark paintings. I wondered if the dark paintings are there to absorb people’s thoughts, their energies. I miss that part of Houston (the museum district). That’s really interesting to consider. I would enjoy experiencing the chapel someday. Wow. I really like this. What an addition to your other work. Hope to see more. yes. And a very good different. The way you have spread the color makes the image look like fabric. I love the subtle texture. Sharon thank you so much! I was noticing that hint of texture also. I love your suggestion that it resembles fabric! Excellent , like the other comments it is a homage to Mark Rothko who without a doubt is my favourite abstract Expressionist artist , both emotionally and physically he was better in my opinion than any other Abstract expressionist whether it is doubt , happiness or depression Rothko was able to express it in his work, some of his early figurative work like the Bathers , Mary and his subway scenes which he painted in the 1930’s show his way of representing alienation. At some time I will be writing a major appraisal of Rothko and his place in the History of art , excellent piece of work. Thank you so much for this comment. I appreciate the things that you expressed about Rothko, your insights are very well put. I look forward to reading your appraisal of Rothko, please let me know when you’ve gone active with that on your site. Thank you again for taking the time to view my work and I very much appreciate your feedback. Reblogged this on Art History blog.